ComplianceSigns.com CONNECTION: The 3 Most Dangerous Jobs in the U.S. There are dangers associated with every occupation. In some jobs you fear spilling your coffee or a meeting that puts you to sleep, in other jobs you fear sinking to the depths of the ocean or getting injured by heavy machinery. Certain jobs simply have more risk and danger associated with them then others. Here are the three most dangerous jobs in the United States, according to data gathered in 2014 by the Bureau of Labor Statistics (BLS). Always in the top three of the most dangerous jobs in the U.S., logging took the number one spot in the 2014 survey by the Bureau of Labor Statistics (BLS) with a fatal work injury rate of 109.5 for every 10,000 full-time equivalent workers - a total of 77 fatalities in 2014. The logging industry is responsible for cutting down and trimming trees, usually in remote places, for sale and transport all over the world. 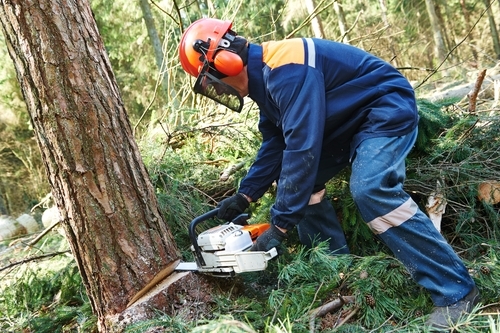 As you can imagine, logging has many associated dangers including dealing with chainsaws and heavy cutting equipment, massive trees falling, sliding and rolling with unstoppable momentum and working in remote and difficult terrain under inclement weather. As a result, many laws and regulations have been placed on the industry to improve safety in the workplace. To continue keeping their employees safe, logging companies should provide safety tech such as satellite phones with SOS and GPS functions to be used in the case of emergencies. The commercial fishing industry is the second-most dangerous job industry in the U.S with a fatal work injury rate of 80.8 and 22 fatal work injuries in 2014. Providing the U.S. and parts of the rest of the world with fish to enrich their diets is not an easy task, nor a safe one. Commercial fishing workers deal with heavy machinery and sharp objects, live and work on boats that fish in dangerous weather conditions and are constantly facing the looming possibility of death by drowning. The industry is not an easy one to regulate in terms of safety since the majority of fishing workers are considered private contractors and are not part of a union. With the help of the U.S. Coast Guard, NOAA and cooperation with those in the industry, safety has become a top priority in recent years. Commercial fishing operations should continue following recommendations by organizations such as the National Institute for Occupational Safety and Health by taking marine safety classes at least once every five years, wearing a PFD on deck, conducting monthly drills with the entire crew and being cautious of marine weather forecasts. With 81 fatal work injuries and a fatal work injury rate of 63.2 in 2014, pilots and aircraft engineers have the third most dangerous jobs in the U.S. Keeping planes and helicopters airborne comes with associated dangers such as crashing, emergency response and the risks of testing equipment. Learn about the new OSHA rule on workplace injury reporting. Visit the NIOSH Industry Safety & Health Topics page.